"The Artist" wins big, while Martin Scorsese receives lifetime achievement prize. 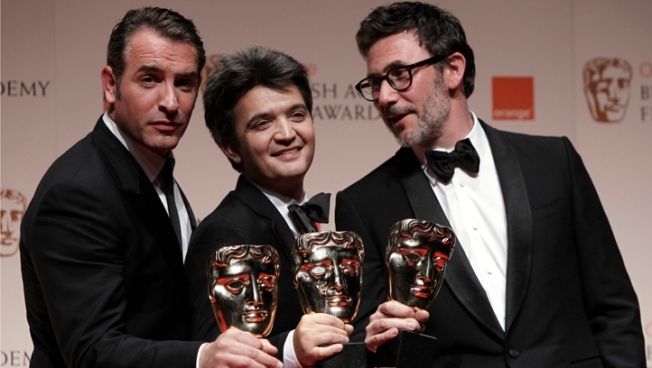 Actor Jean Dujardin, producer Thomas Langmann and director Michel Hazanavicius with the awards for 'Best Leading Actor, Best Film and Best Director' all for the film 'The Artist' backstage at the BAFTA Film Awards 2012, at The Royal Opera House in London. Silent movie "The Artist" had a night to shout about Sunday, winning seven prizes including best picture at the British Academy Film Awards. Britain's equivalent of the Oscars rewarded the French homage to old Hollywood over a homegrown favorite, espionage thriller "Tinker Tailor Soldier Spy." "The Artist," a black-and-white picture that has charmed audiences around the world since its Cannes debut in May, was named best film, and its rubber-limbed star Jean Dujardin took the male acting prize. Its filmmaker, Michel Hazanavicius, won prizes for directing and his original screenplay. Dujardin said it was "incroyable" — incredible — to win a prize in the homeland of acting titan Laurence Olivier, William Webb Ellis — the inventor of rugby — "and Benny Hill." Hazanavicius thanked presenter Brad Pitt for pronouncing his name correctly — and academy voters for recognizing that his silent film even had a screenplay. "So many people thought there was no script because there was no dialogue," he said. Another homage to early cinema, Martin Scorsese's Parisian fantasy "Hugo," took prizes for sound and production design. John le Carre adaptation "Tinker Tailor Soldier Spy" went into the ceremony with 11 nominations compared to 12 for "The Artist," but won just two prizes, for British film and for adapted screenplay. Writer Peter Straughan dedicated the screenplay award to his wife and co-writer Bridget O'Connor, who died of cancer before the film was completed. "She wrote all the good bits and I made this coffee," Straughan said. "So, Bridget — I love you, I miss you. This is for you." The British prizes, known as BAFTAs, are considered a strong indicator of likely success at Hollywood's Academy Awards, to be held on Feb. 26. The trophies give more momentum to "The Artist," which has already won three Golden Globes, and has 10 Oscar nominations. Dujardin, who plays a silent screen icon eclipsed by the talkies, said the appeal of "The Artist" lay in its accessibility. "It's a simple story," he said. "It's a love story. It's universal. And there's a cute dog" — Jack Russell terrier Uggie, who almost steals the film from his two-legged co-stars. "The Artist" also won prizes for cinematography, costume design and for Ludovic Bource's sprightly musical score. As predicted, Meryl Streep was named best actress for her depiction of Margaret Thatcher, Britain's first female prime minister, in "The Iron Lady." The film also won a well-deserved prize for hair and makeup. "The ambition of this film was to look at the life of the Iron Lady from the inside out, and to locate something real — maybe hidden but truthful — in the life of someone we've all decided we know everything about already," Streep said. The supporting actor prize went to Christopher Plummer, as an academic who makes a new start late in life in "Beginners." Octavia Spencer was named best supporting actress for her turn as a fiery maid in Deep South drama "The Help"
Spencer said "The Help" had been called "an American movie about American problems and American history." "I am so grateful to you for seeing past that," she said. "Because surely oppression knows no gender, no sexual orientation, no country." George Clooney, Pitt, Jessica Chastain, Penelope Cruz, Colin Firth and Judi Dench were among the stars who braved the London cold and bouts of sleet to walk the red carpet before a televised ceremony, hosted by comedian, writer and actor Stephen Fry, at the Royal Opera House. Many of the frocks were in muted or pastel tones, though "The Help" star Viola Davis, a best-actress nominee, arrived in a pink Valentino "eco gown" made from recycled plastic bottles. Presenting the award for special effects, Cuba Gooding Jr. paid tribute to singer Whitney Houston, who was found dead in a Beverly Hills hotel on Saturday. "Whitney, I will always love you," he said — a reference to one of her best-known songs. The effects prize went to "Harry Potter and the Deathly Hallows — Part 2," the final film in the magical franchise and the top-grossing British movie of the year. Actor-turned-director Paddy Considine and producer Diarmid Scrimshaw took the best British debut prize for the wrenching domestic drama "Tyrannosaur." "Kidulthood" actor Adam Deacon won the rising star prize, the only category selected by public vote. "Senna," a portrait of the short, sensational life of race car driver Ayrton Senna, was named best documentary and also won the editing prize. Scorsese received the BAFTA Fellowship, a lifetime achievement prize, for his "outstanding and exceptional" contribution to cinema in films including "Taxi Driver" and "Raging Bull." Veteran British actor John Hurt was given an honor for outstanding British contribution to cinema for a career that includes memorable roles in "Elephant Man," ''The Naked Civil Servant" and "Alien." Hurt said his advice to young people would be the same as Noel Coward gave to him when he was an aspiring actor: "Press on." "Press on, and don't let anybody get in the way of your instincts," Hurt said. In recent years, the British awards have helped underdog films gain momentum for Hollywood success. In 2010, Danny Boyle's "Slumdog Millionaire" won seven BAFTAs, including best film; it went on to take eight Oscars. Last year "The King's Speech" won seven BAFTAs and four Oscars, including best picture.